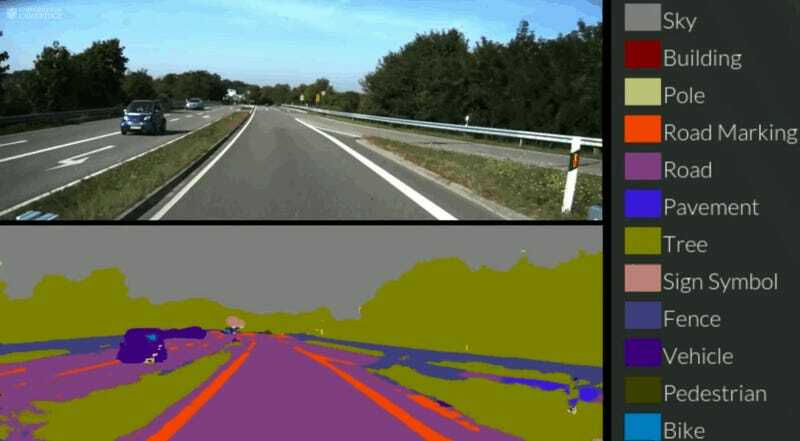 A team of researchers from Cambridge University is borrowing some of the techniques used in autonomous vehicles to teach your phone to navigate, even when it doesn’t have access to positioning information like a GPS signal. SegNet learns by example – it was ‘trained’ by an industrious group of Cambridge undergraduate students, who manually labelled every pixel in each of 5000 images, with each image taking about 30 minutes to complete. Once the labelling was finished, the researchers then took two days to ‘train’ the system before it was put into action. The second system uses footage from the street scene to discern where the phone is, using the geometry of buildings and street furniture to discern location. The system has so far been tested in the center of Cambridge, where it’s been shown to be “far more accurate than GPS.” It’s very similar to the way most autonomous cars, including those made by Google, compare sensed data to existing prior maps to orient themselves on the road. Don’t think that your phone will suddenly turn your car into an autonomous vehicle, though. “In the short term, we’re more likely to see this sort of system on a domestic robot – such as a robotic vacuum cleaner, for instance,” explained Roberto Cipolla, one of the researchers working on the project, in a press release. Gotta start somewhere, eh?